Kansas City, MO - Metals USA, Inc, one of the largest metal distributors and processors in North America, has installed and commissioned a high production "state-of-the-art" Precision Electronic Servo Feed Leveling/Cut-to-Length Line at its Liberty, MO (Kansas City) facility. 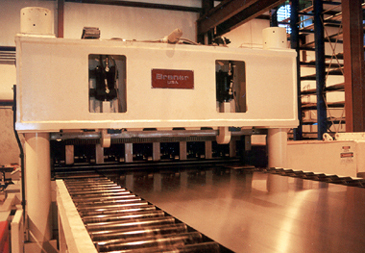 The new line, designed and manufactured by Braner/Loopco, Schiller Park, IL, is designed to convert 300 and 400 series stainless steel and aluminum alloy coils into panel flat precision tolerance sheets and blanks. The new line is capable of processing 84" O.D. coils weighing up to 40,000 lbs in widths from 18" through 72". The line has the capacity to corrective level and shear stainless and aluminum throughout a gauge range from .032" to 1/4". Leveler: The ability of a roller leveler to remove strip shape defects in any given material is limited by the leveler's work roll size, roll centers, structural rigidity, and horsepower. The Metals USA cut-to-length line is designed to level and shear stainless and aluminum coils throughout a gauge range from .032" through .250" thick, with typical stainless steel and aluminum yield strengths. This shape correction leveling range would require two (2) conventional "fixed roll" roller levelers installed in tandem. Rather than installing two independent levelers with the attendant maintenance and synchronization difficulties, Metals USA elected to install Braner/Loopco's "Cassette Leveler" with two (2) interchangeable work roll "cassettes". Cassette levelers have the distinctive ability to operate with interchangeable leveler cassettes, with each cassette containing a different roll size for leveling a specific gauge and product range. The Cassette Leveler frame is designed to operate with 4-hi, 5-hi, and 6-hi light and heavy gauge cassettes, with the structural rigidity and driving power to process the heaviest and toughest coils. The Metals USA leveler is a Cassette Leveler structurally designed and powered to shape correct 1/4" x 72" stainless steel, but has the ability to shape correct low strength light gauge aluminum. A cassette with 3.000" work rolls is utilized to level coils from .250" to .090" thick, and a second cassette with 1.750" work rolls is utilized for leveling coils from .125" to .032" thick. Both cassettes have 6-hi roll arrangements for leveling top and bottom surface critical materials, and both are equipped with seven (7) adjustable back-up flights for precise shape correction. The cassettes automatically couple with a common leveler frame drive train. The Cassette Leveler with two cassettes allows Metals USA to provide superior flatness quality throughout the entire .032"-.250" stainless and aluminum gauge range. Cassette Injector: The leveler cassettes are installed and removed from the leveler frame by a powered "Cassette Injector". The Injector table has the ability to store two cassettes and shifts from side to side to align cassettes for installation and removal from the leveler frame. The Cassette Injector is fitted with a powered "Cassette Opener" that grips the upper portion of the cassette and opens it like a "book" for convenient tabletop cleaning and servicing while the line is operating with the second Cassette. The ability to service leveler work rolls and back-ups outside of the leveler frame greatly simplifies leveler maintenance, and the ability to run the line while servicing the leveler rolls greatly improves productivity. Precision Electronic Feed: The Cassette Leveler levels the strip and drives it into a free loop ahead of the Precision Servo Feed and Shear. Quadrant tables located at the entry and the exit sides of the pit support the free loop. The quadrants are designed to prevent the strip from being bent to a radius that would re-introduce coil set. Power adjusted side guides are utilized to guide and square the strip as it enters the Servo Feed. The Servo Feed, installed immediately ahead of the Shear, precisely measures the sheet length while it feeds the strip into the Shear. The feed rolls are profiled low inertia rolls with a special high friction non-marking surface. Both upper and lower feed rolls are driven from a zero backlash gear reducer by a microprocessor controlled servomotor. 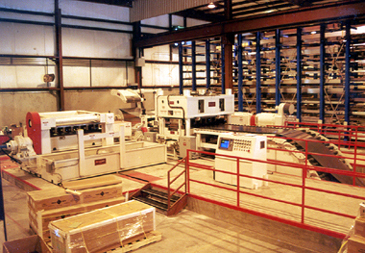 The Servo Feed, electronically synchronized with the leveler, pulls the strip from the free loop and feeds the Shear. The feed cycle is programmed to start with controlled acceleration up to the maximum feed speed. It then enters a controlled deceleration to a full stop when the exact part length has been reached. The Shear is given a signal to cut, and the feed cycle begins again. A high-resolution precision electronic encoder continuously monitors the feed length to within thousandths of an inch during the feed cycle. After the Shear has completely cut through the strip, the Servo Feed reverses the strip .002" to prevent the shear blade from "wiping" the leading edge of the strip. This anti-wiping feature produces a cleaner sheared edge and prevents premature dulling of the shear blade. The Servo Feed offers high productivity and precise tolerances, and because of few moving parts, superb reliability and virtually zero maintenance.